For any Comixology users, there's a whole heap of Marvel collections on there at the minute for 69p a pop. Just wanted to post a quick update here as, since last time, my Kickstarter target has been reached and then some! And there's still 25 days to go. So it looks like this thing is definitely happening! Thanks for all the kind words, and for those who have backed or are planning to back. Currently at 82% of my target and only 2 days in, so going pretty well so far. So here we go so far - sanded, primed, and painted in matte black. Next step is to mask off everything i want to keep black and then crack out the red paint. Have to say that this next stage is where I start worrying about things getting a bit messy. Glad you enjoyed it Bolt! It does seem to have vanished from Amazon and I'm guessing that Markosia have moved on to other projects now. It is still available in digital format though, and i have just received another batch from Makosia which came straight from the printers, so copies can be ordered from me (free p&p) or if you catch me at a con anytime this year (next up Birmingham Edgbaston). Looks really good. How are you going to do the visor? Some online forums I've checked recommend using a welding mask visor or motorcycle helmet visor. Had a bit of helmet time today so did most of my cutting out. Still needs a little bit of sanding down, but I'm quite pleased that I've got past that stage without completely bodging it! 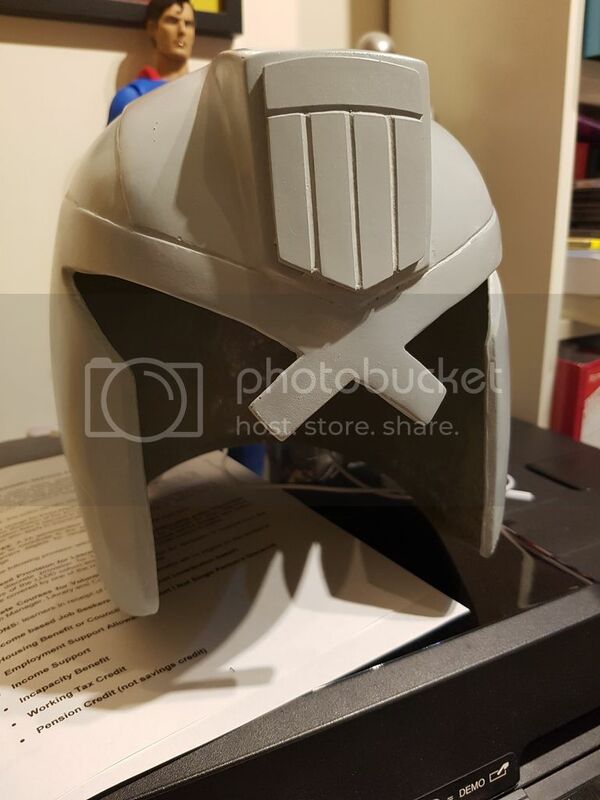 is that photo flipped or does it really say DREDD backwards across the face? 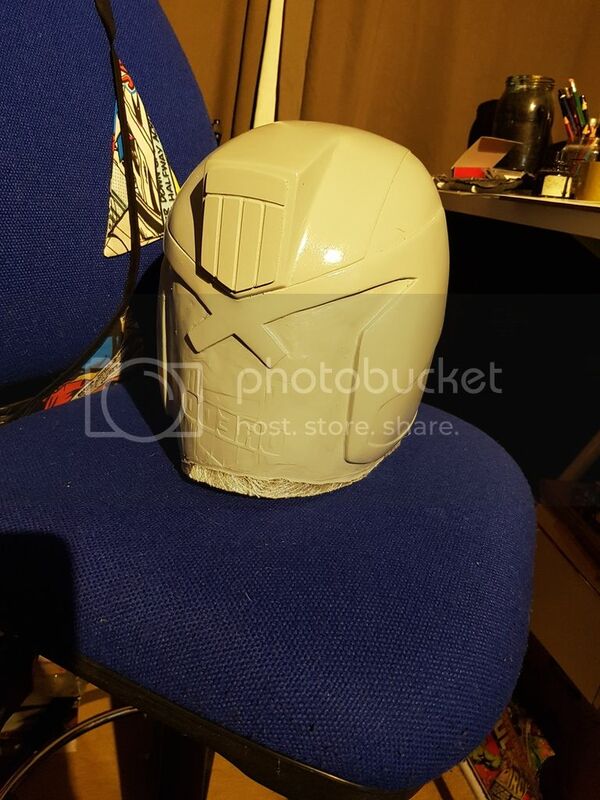 I'b be tempted to create the visor by cutting horizontally and removing the lower face part - good luck with all that - I'm terribly kak-handed and I would doubtless ruin it instantly, but I love seeing other more capable people doing stuff ,like this! It's not flipped and it does say Dredd backwards - obviously a reverse imprint from a badge, but couldn't say why. Thanks Krakajac - there's a Dremel 3000 on Amazon for just under £40, reckon that should serve my purposes. Good point about the dust mask too! Uhh this is going to become a good thread. Can't offer anything constructive but my enthusiasm for regular updates on progress! 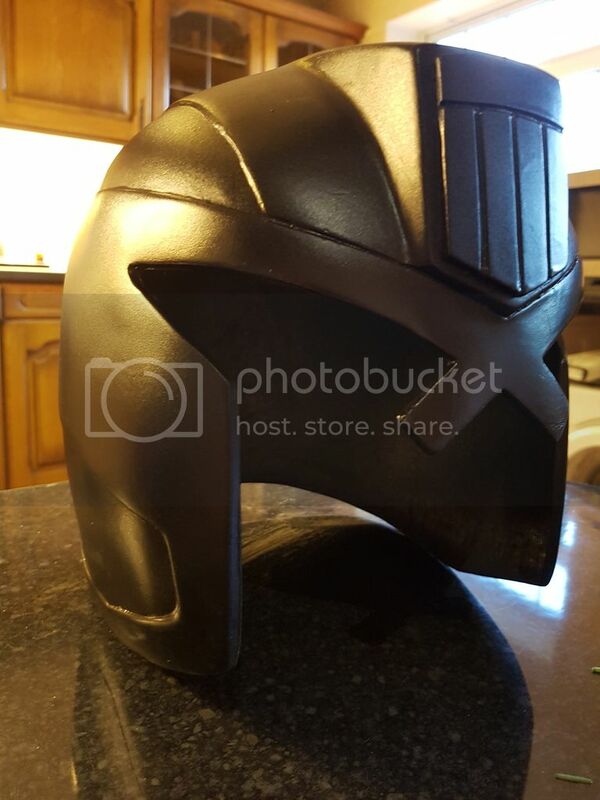 I bought this fibreglass Dredd helmet off a guy on eBay, and wondering where to start with it. I guess the first thing is to trim away all the excess bits round the edges. Anyone recommend the best tools to use before i just delve in and balls it all up? General / Re: Dirt cheap Bolland Dredd T-Shirt from Forbidden Planet! Just had an email that the item is out of stock and I won't be charged. Bit gutted but ah well. Same here. Can't say I'm too bothered tbh. It's a nice t-shirt but I probably wouldn't have bought it (or tried to) if it hadn't been on offer so not a real loss.